AMP is proud to announce our new and improved Attack M/T A. As an off-road enthusiast there are many challenges that you may encounter. From deep mud and slippery rocks to impossible trails you need a tire that can conquer it all! 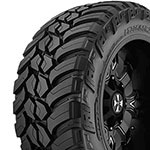 AMPs oversized M/T A tires feature an aggressive tread design with maximum traction especially in aired down driving situations.